This is for accepted session presenters only. Must be accepted as a Building Museums Volunteer before registering. Please contact admin@midatlanticmuseums.org with questions. 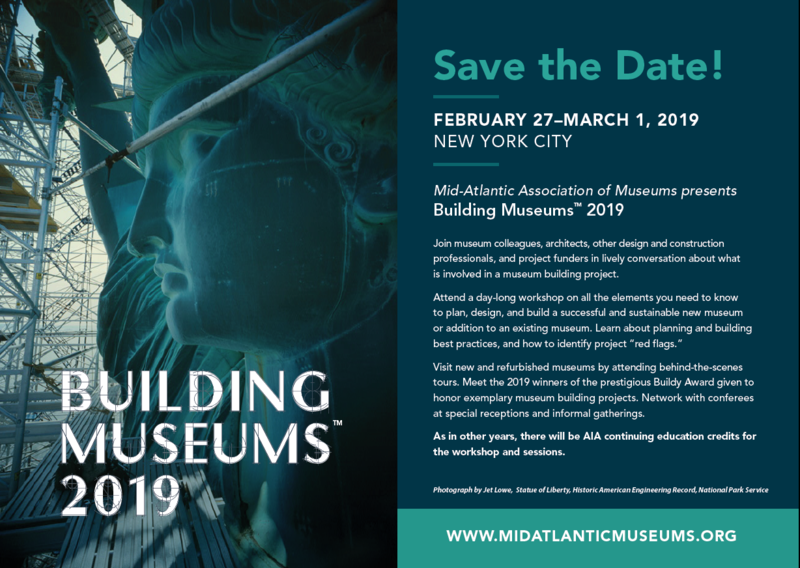 Join museum colleagues, architects, other design and construction professionals, and project funders in lively conversation about what is involved in a museum building project. Visit new and refurbished museums by attending behind-the-scenes tours. Meet the 2019 winners of the prestigious Buildy Award given to honor exemplary museum building projects. Network with conferees at special receptions and informal gatherings. I am a MAAM Member, how do I get my discount? I am a NEMA Member, how do I get my discount? Please contact your NEMA Membership administrator to receive your registration code to register as a NEMA Member. If you need to cancel your registration for Building Museums, we will provide a refund of the ticket price, less a $20 processing fee, up to February 20, 2019. We must receive your refund request in writing, by email, or in a written statement through WildApricot no later than February 20, 2019 explaining the need for a refund. After February 20, 2019, no refunds will be granted.